I'm scared. I'm excited. I'm nervous. I'm energized. It must be the start of a production. I've been working for months already, but the second we post that cast and crew list, that's when the rollercoaster takes off. It's as if I've been sitting in the rollercoaster seat, buckled and ready to go, but I've been waiting for the rest of the riders to join me. Now is when the fun begins. For actors, that moment is the when you hear your cue for your first entrance on opening night. As a director, I seem to feel that feeling in the 20 minutes before every rehearsal. Or as I'm preparing the night before. Right now I write this as I prepare for our first all cast and crew meeting, and I'm feeling the rush of adrenaline. I want to communicate so many emotions and facts and schedules and I can't begin to do this all at once. It's a good thing we don't ride the rollercoaster of a theatrical production alone. I look foward to hearing about everyone's ups and downs. It's what brings us together as a community. And just so I don't forget, here are all the chugging up the hill kind of things we need to talk about at the meeting. I only assisted sporatically in the first 2 mainstage productions, but as I observed most of the routines, reactions, traditions, and values, I thought I had a solid grasp on everything. I talked with the directors and crew a lot about the ups and downs, researching the best ideas to continue and brainstorming ideas to alter. Then during the Winter Play I really learned everything through trial and error. I have received a lot of feedback since then, and I want to improve. That's my job, right? I'm a teacher, so I'm supposed to keep learning and encourage others to keep learning, right? I hope over the next 9-10 months as we prepare for our new facilities, we also prepare for a renewed comittment to excellence. Let's use this time of change to make some decisions about how to celebrate what MHS Theatre is and also commit to a solid mission and goal for our future. I will be heading a committee of Drama Club students, teachers, directors, and administrators to create a handbook that outlines these missions and goals. 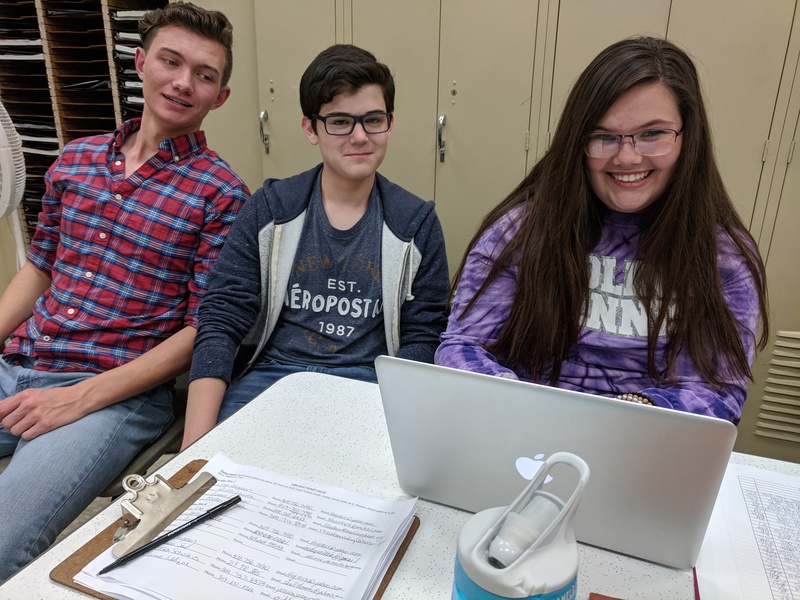 We want to decide what's most important to MHS Theatre and then brainstorm how to make our meetings, productions, rehearsals, and other events uphold those values. If you'd like to be a part of the committee, contact me by the end of April. We'll have our first meeting in May. One of my students, a freshman, came to East of the Sun, and she told me how much she enjoyed it. In fact, she said she cried a few times. She was surprised at herself, but she really felt all of Tove's feelings when she watched the Prince being taken away by the trolls at the end of Act I. That intensity is why I'm proud to be a Moliner. We remind our audiences what it's like to be in the moment, invested in another person, vulnerable to sharing emotions with a group of people you may not know. My student also laughed a lot, so she walked away from the show feeling empowered and joyful. Me too. What did you learn at Theatre Festival? 35 students attended workshops and performances at Illinois State University, January 11-13, 2018. A few of them chose to share their experiences here. I learned dancing isn’t all about skill. I’m not the finest dancer so doing broadway, hip hop, and monster bash dancing made for quite a struggle at first. Getting into it though, I realized dancing is mainly about feeling. The skill makes it shine for others to see but the improvisation and the personal spins one can put on a dance are what make up dancing’s fundamentals. On our last day at theatrefest, I went to go see the Complete Works of William Shakespeare (abridged). The basic plot of it was a group of performers trying to perform 37 of Shakespeares plays. I learned about many more different ways to perform and interpret scenes from shows. I will use what I learned to improve my performance in Moline Theatre. I learned a lot this weekend about all my friends and a lot about theater. The workshop I did attend paled in comparison to the time I spent with my friends seeing shows and walking around campus. I find that my personal relationships have been strengthened by the time we spent together. I went to my first dance workshop and it was a really fun, entertaining, and learning experience because now I know how hard it actually is to dance and to do it well. I really enjoyed my first experience at theater fest this year! It was a great way to try new things and get out of your comfort zone. In a workshop I attended, my friends and I danced to a fairly difficult Broadway number. It was such a great experience to learn how dance auditions for any sort of show. It was a great way to let loose and try something new. Stay tuned for more! Or come to Drama Club on Jan.16 or Jan.30, 3:15-4 in E114. The rehearsal process for Chicago has begun and we couldn't be more excited! The parents and cast had the opportunity to receive some background on the show as well as meet their directing staff. Afterwards, the cast got their scripts and had their first readthrough of the script and the music. The glorious voices of this talented cast cascaded throughout the choir room as they sang through the songs. Their enthusiasm radiated through the dancing and laughter that filled the space. The grins that held the faces of the directing staff, cast, and stage managers foreshadows the wonderful show to come. See you on December 7th, 8th, or 9th at 7pm at Moline High School. Saturday night will be a big night of appreciation: our last show in the auditorium before renovations! Stay tuned for more photos, videos, and more! 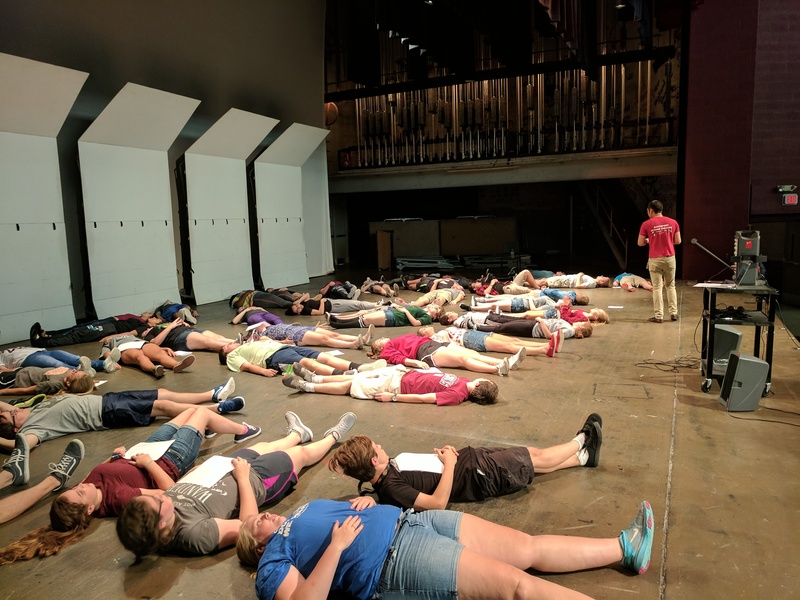 What a busy first week of Theatre Events at Moline High School. 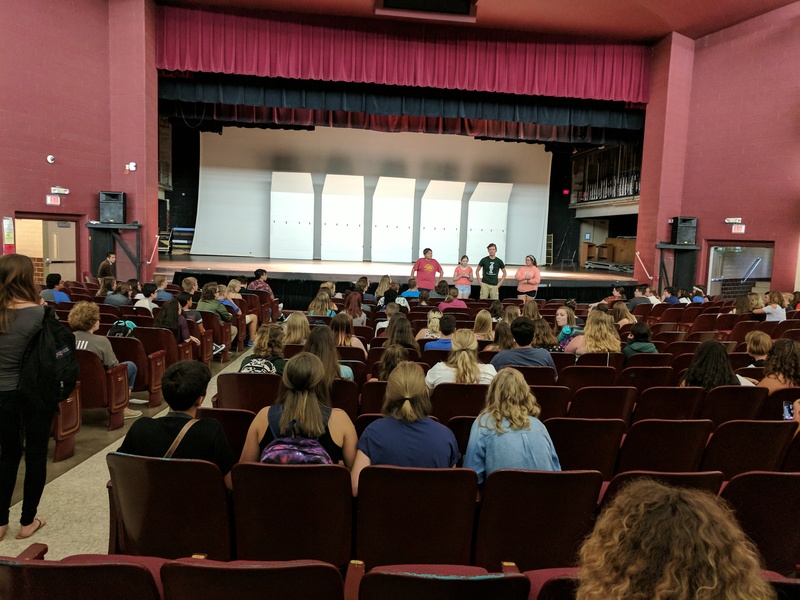 We had our first Drama Club meeting, attend by about 100 students. We had auditions for the fall play, Iphigenia, and there were 72 auditioners. We also have more auditions coming up this week: Callbacks for Iphigenia and Auditions for the ComedySportz High School League troupe. I feel very welcomed into this amazing group of students. I'm excited to see how we grow this year. If you'd like to be a guest blogger on our website, contact me at [email protected] Or just come to Drama Club and volunteer.